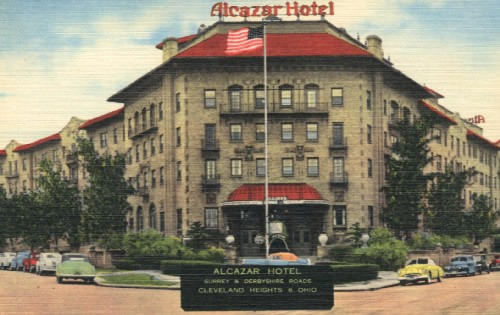 Built in 1923, the Alcazar Hotel was the first suburban hotel in the greater Cleveland metropolitan area, with its 175 apartments primarily serving a residential and family clientele. In addition to its residential role, the Alcazar provided space for a wide variety of entertainment. In the 1920s and 30s, the hotel advertised Saturday night dining and dancing, tea dances, musicals and dancing school recitals. Since the early 1970s, Western Reserve Residences, a Christian Science organization, has operated the Alcazar as a private residential hotel. The Alcazar is a Cleveland Heights Landmark. Architect H.T. Jefferey chose a design that reflects Moorish buildings in Spain and was directly inspired by the Alcazar and Ponce de Leon Hotels in St. Augustine, Florida. The general vogue for Spanish architecture in the 1920s, of which the Cleveland Heights Alcazar is an early representative, is related to the Florida boom of those years. The more obvious Moorish characteristics are in the interior. Colorful glazed tiles copied from those in the Alcazar in Seville, decorate the stair risers, comprise a three foot dado in the lounge, and provide beautiful highlights on the small sculpture fountain. Dramatic columns with spiral moldings and sculpted dragons, wrought iron grilles, a massive medieval style fireplace and bold squared-off sculptured doorframes continue the Spanish-Moorish design elements. On the exterior, H.T. Jefferey established the resemblance to the Florida hotels through several elements, including the pitch of the red tile roofs, the overhanging roofline, the arcade of long windows with balconies, and the cloister arcade of the courtyard. The Alcazar’s interior open garden court is a distinctive Spanish architectural feature of the building. The circular fountain, with its tall finial and spouting frogs and turtles, is a copy of one at the Hotel Ponce de Leon. The well-known Cleveland firm of Fischer and Jirouh executed the fountain, as well as all the other sculptural work.